Over the weekend I went on a joint Astronomy/Geology department field trip to visit some cool geologic sites in eastern New York state. As a planetary scientist, it is good to sometimes go out and actually, you know, study an actual planet. I will do my best to describe some of the sights here, but I’m afraid my field geology skills are lacking so I won’t nearly do the locations justice. 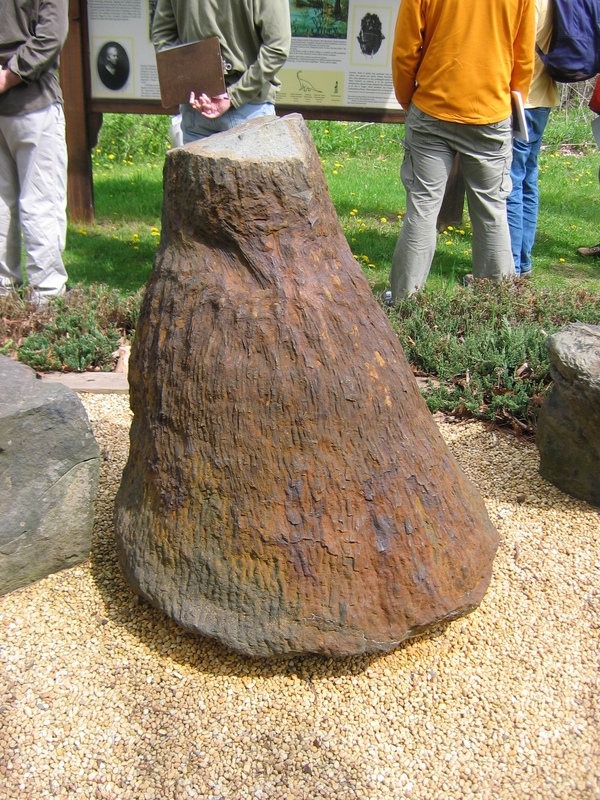 We started off the trip driving east from Ithaca and our first stop was near the town of Gilboa, where hundreds of fossilized tree-fern stumps. The tree ferns probably grew 9 to 12 meters tall, and lived at a time when they only animals on land were the first amphibians! Next, we went east through the Catskill mountains, which are actually the remains of an ancient delta, where sediments were deposited into a shallow sea. We stopped at a road cut, where the layers of rocks were deposited by waves on the shore of an ancient sea. You can tell this because the rock layers are inclined, which means they are the remains of ripples and dunes or, in this case, ancient beaches. The next stop was another road cut that records one of the most significant events in eastern North American geology: the Taconic orogeny. Orogeny means “mountain building” and the Taconic orogeny occurred when an island arc (think Indonesia) collided with the proto-North American plate and formed a huge mountain range. In the picture below, the rocks tell quite a story. On the right, the layered rocks were deposited when sediment from proto-North American ran down to the ocean and was deposited. Then those rocks were tilted by the collision of the Taconic island arc and “planed off” by erosion. Then, because the Taconic Orogeny formed huge mountains, tons of sediment from those mountains blanketed the underlying bedrock, forming a new set of sandstone layers. 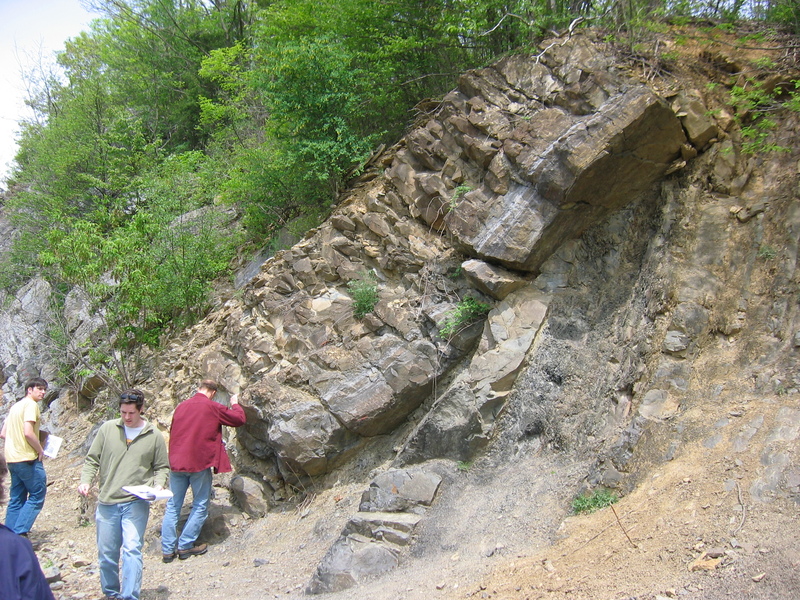 The intersection of these two layers is called the “Taconic unconformity”. 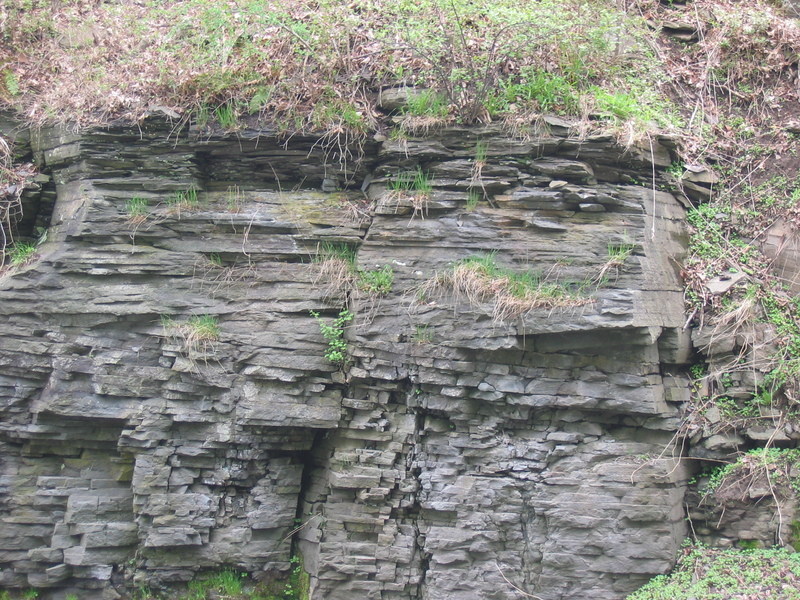 An unconformity in geology is a place where two rock surfaces of different ages come into contact, and indicates that there was deposition, erosion, and then more deposition. Anyway, the second set of layers was deposited, and then, in another bout of mountain building, both sets of layers were tilted again into the orientation we see today! Phew! The last stop on day 1 was a location where ancient shales had been metamorphosed – changed by heat and pressure into an entirely new kind of rock. It was especially interesting, because in the exposed rock, you can see faint hints of the original layers of shale, but the rock clearly broke along a direction almost perpendicular to the ancient layers. This had me confused for quite a while because I just assumed that the prominent layers that I was seeing were the original layers of the shale, but a real geology-type explained that I was actually seeing the “cleavage” – the direction in which the rock broke. 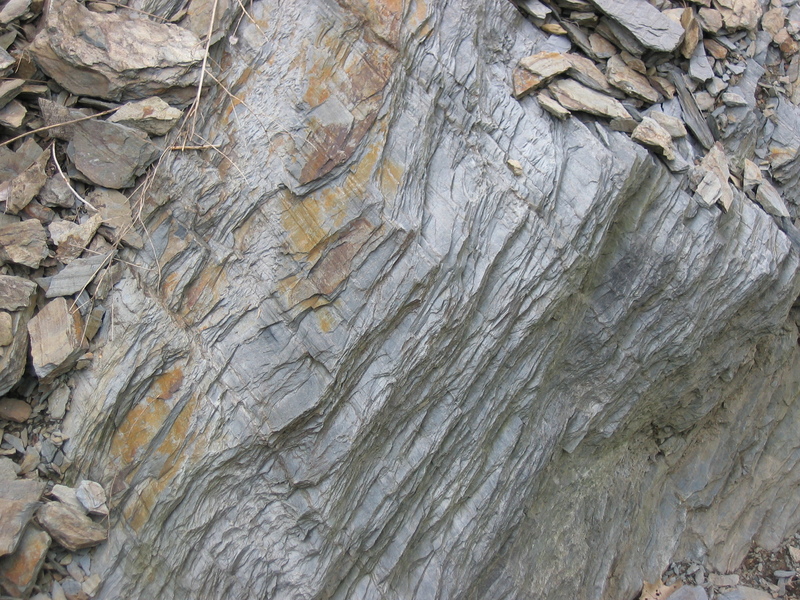 In the picture, the shale layers go from upper left to bottom right, but the cleavage goes from lower left to upper right. That wraps up the stops from day one. I’ll post tomorrow about day two, in which we saw fossils of the earliest forms of life on earth, rocks from 35 kilometers down in the earth, and the scars left by a waterfall that would put Niagara to shame. This entry was posted on May 14, 2008 at 1:03 am and is filed under Earth, Geology, Not Mars, Pictures. You can subscribe via RSS 2.0 feed to this post's comments. Both comments and pings are currently closed. Sounds like a wonderful trip. I am thinking of taking my 7th grade Science class on a geology trip. Can you give me some information about your trip. Guided? Self? Location? Start point, end point? 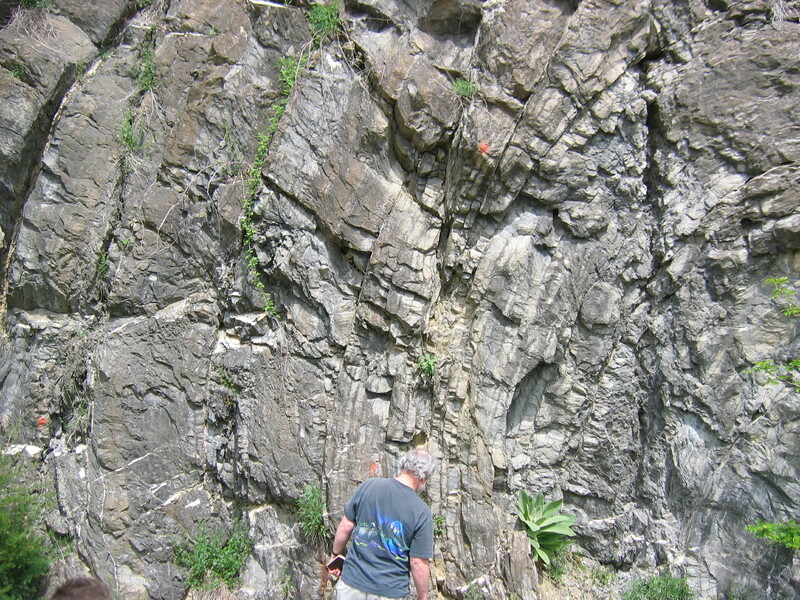 You also could check out the New York guide to roadside geology. If you do the field trip, the potholes at Little Falls on the Mohawk (see my post about day 2) are really cool, I highly recommend that stop!